Before getting to the nitty-gritty about fishing and GPS, let’s quickly cover how fish finders work. Fish finders use SONAR – the same technology used by submarines and ships in the war. This paints a brighter picture for our future, doesn’t it? Old war technologies are now being used for the greatest pastime and bonding experience on Earth! So there are two main parts to a fish finder. The main unit has the screen and all the software. The transducer is installed somewhere on the boat so that it is always in contact with water, like the transom or the hull (this depends on the kind of transducer you buy – most fish finders ship with a transom mount transducer out of the box). The transducer sends out SONAR waves at very high frequencies, and listens for the echo. It catches the echo, and sends it through the wire to the main unit, which draws the echoes on the screen. The logic is that the faster an echo comes back, the closer the object is, and vice versa. The stronger the echo, the harder the object, and vice versa. Pretty simple, right? Frequency & Power: These two factors are inter-related. Power is how far your transducer can send out SONAR waves, and frequency is how fast. With frequency, it’s usually that faster means less depth but greater detail. 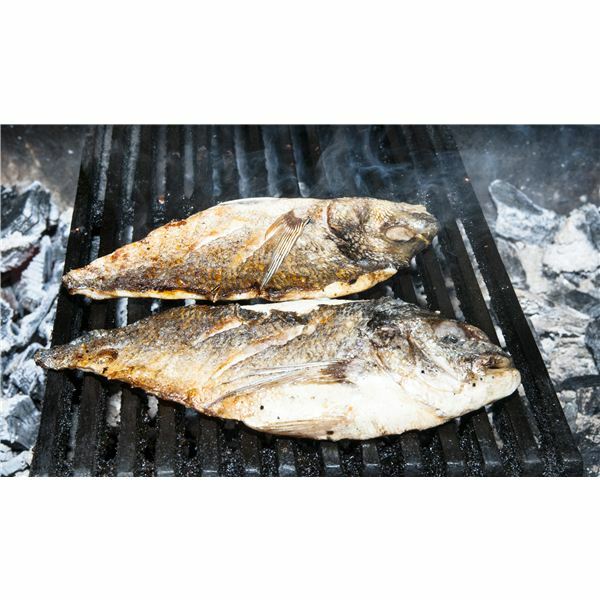 Most fish finders are dual frequency(measured in kHz), usually in pairs of 50/200, 83/200, and 455/800. 455/800 fish finders are called 3D SONAR. 3D SONAR: The latest and greatest in fish finding technology, 3D SONAR is so good that it can literally “draw” the underwater image for you on-screen. 2D SONAR(50/83/200 kHz) shows readings as “echoes” and “color blobs,” but 3D SONAR shows you the closest you can get to the real thing. Screen Size: Aside from 3D SONAR, this will probably be the biggest determining factor for price. Larger screens are easier to read, naturally, and usually models with larger screens also have more advanced bells and whistles. Most fishfinders have the GPS antenna built-in, with the exception of a few models, like the Humminbird 1158c, which has an external antenna. 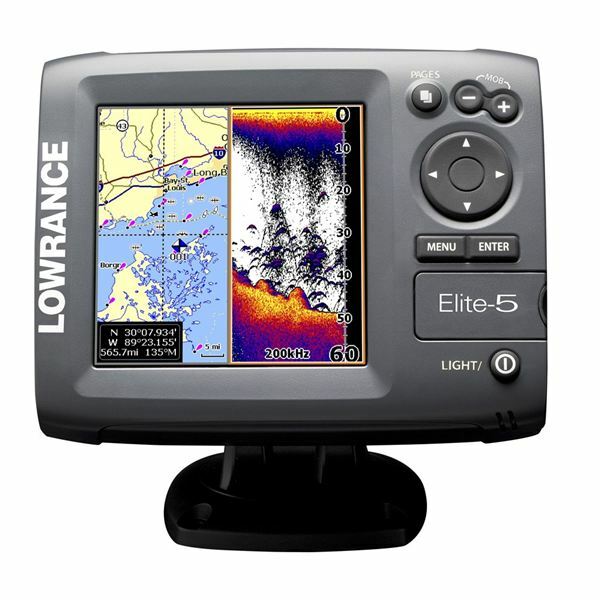 Basemap: Some units, such as this model of the Elite-5 by Lowrance, come with basemaps preloaded. As you can guess from the name, this is the most basic map – in the United States, most “basemap” units ship with a basemap of the United States – basemaps do not have any contour, depth, or extra data. You can just expect to see blue for water, brown/green for land. 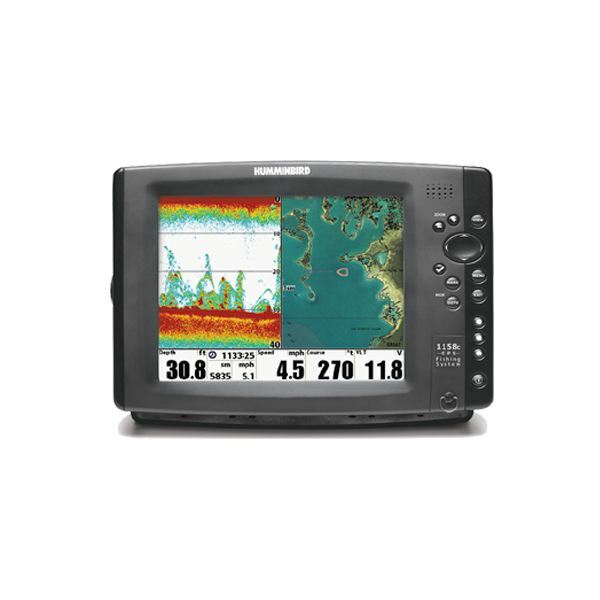 ContourXD: ContourXD is Humminbird’s version of a basemap. It covers 3,000 U.S. lakes, and shows depth contour lines, U.S. lights/markers, and interstate highways. This charting package is provided by Navionics – and is a pretty decent package, found on Humminbird 700, 800, and 1100 series models. Navionics Gold: What I like to call the “king of charts”, these charts can cover an entire continent, and still be able to zoom in down to 3 meters. They show tides and currents, port plans, depth contours, marine services contact information, and marsh areas. Navionics Gold charts are available on select Lowrance units, such as the HDS multi-function displays. BlueChart g2 Vision: This is Garmin’s answer to Navionics – BlueChart g2 Vision features auto-guidance technology, where you enter a waypoint and the charts will automatically search for the safest and fastest route customized to your boat size. You can also view satellite images of the bigger ports and shorelines, as well as a 3D view of the land and an underwater view as would be seen from the waterline. Lowrance Lake Insight: These charts have incredibly detailed views of 650 lakes from the Midwest, with 1-3 foot contour data! As well as that, there are crowdsourced fishing hotspots on certain lakes, as well as contour and relief data for over 5,000 U.S. lakes. Get Navigational Data: The internal GPS can show your heading and average speed, as well as an ETA for your waypoint or destination. Set Waypoints: You can save your favorite spots on your fish finder’s charts as waypoints. A waypoint is like a “memory” on the whole chart. Next time you are on the same lake or river, you can just choose one of your saved waypoints and navigate straight to it. Set Routes: A route is a collection of waypoints, from point A to B to C to however many points you want to go to! Routes are the most basic way of “true” navigation. Your fish finder will show your heading, and a suggested track to get to the waypoint. An important question to ask yourself before investing in a GPS fish finder combo is whether or not you want a fish finder that has GPS, or a GPS chartplotter that has fish finding capabilities. More Safety than Convenience: If you fish the high seas, going out for miles outside the bay, your best bet is to get a chartplotter that has GPS – like the Garmin GPSMAP series. These are all chartplotters at heart – and as an extra feature, they have fish finding capability at 83/200 kHz – which is ideal for the sort of depths you would be fishing in the deep sea. More Convenience than Safety: When you are fishing local lakes and rivers, a fish finder with GPS should do the trick. The best use of this would be when fishing in a tournament. Many champion anglers like to go over the entire tournament lake once or twice using SONAR to mark off waypoints so they don’t need to look for spots when time is of the essence. As a final note, having GPS capability is a big boost to your game. Of course, you have to consider your budget and boat size before you buy, but shelling out the extra cash will really pay off. About the Author: Shabbir Nooruddin is the founder of Fish Finder Source, the #1 experts in fish finders. He is an outdoor lover, and when he isn’t outdoors, you can find him reading a book, relaxing, and enjoying life to the fullest! To shop for fish finders, check out Fish Finder Source’s website.